The Time After Time Tablerunner is quite a diverse pattern – in this one we give four seasonal tablerunner patterns covering applique and thread painting and two finishing styles! The pattern includes a version for each season, each using different techniques to complete the center. Having that small focused area for a technique makes it the perfect project to try out something new! We talk a little bit about the different looks in this intro video, and our inspiration. 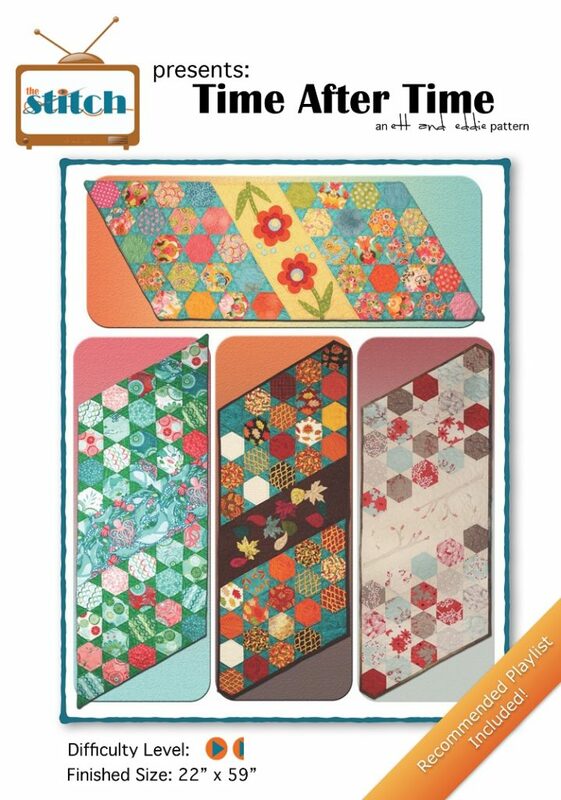 We’ve included a paper template for the charm-sized hexies and setting triangles so you can mark and trim the hexagons with a regular quilt ruler if you don’t have an Accuquilt die or other hexagan ruler. Here are the four seasonal version! If you’d like to check it out, visit the pattern shop! If you make a version yourself, find us on social media @TheStitchTVShow, and tag your photos of your version with #TimeAfterTimeTablerunner.